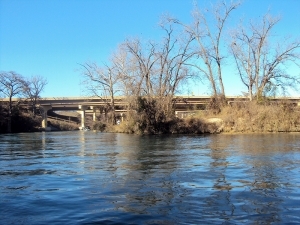 The Mr. and Mrs. Bass Club of Austin held its first tournament of the 2011 season Saturday January 22nd on Lake Dunlap in beautiful New Braunfels. For most of the teams that braved the icy morning temperatures, Lake Dunlap turned out to be a “Dunflop”. 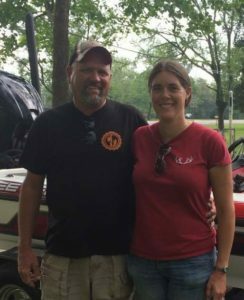 Eleven Mr. and Mrs. teams participated in the season opener and despite the initial high expectations for this fishery, only one limit of bass was caught on this day and the biggest fish landed was less than three pounds. Three teams failed to bring a single bass to the scales. There was another tournament held at the same time and ramp and they reported equally low numbers of bass weighed in. 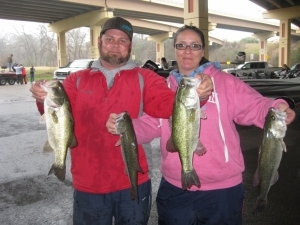 Despite the lower than normal number of bass caught, the Mr. and Mrs. Bass Club still had a successful and fun tournament to start the 2011 year. As we always do, club members had a nice time eating together and telling fish stories at Schobels restaurant after the tournament. Club members now set their sights to Lake Belton where the next tournament will be held on February 19th.